My daughter starts her job in a week and a half. As I have said before, it’s a real job. A talent development program, with health insurance. A great first step towards figuring out what role work will play in her life. Pays enough that she can live on her own. A very significant event, both as recognition of her accomplishments to date and as a platform for the future. So needless to say I took her shoe shopping. We went to a Marshall’s Megashoe something or other. This is not my territory. I usually buy Ferragamos or Stuart Weitzman from Nordstrom or even Neiman Marcus. I tell everyone that it’s because they are the only shoes that fit me, but probably those years of my mother taking us to Saks and having Mrs. Bailey find us clothes have left me psychologically damaged for the world of bargain shopping. Luckily my daughter has no such scars. 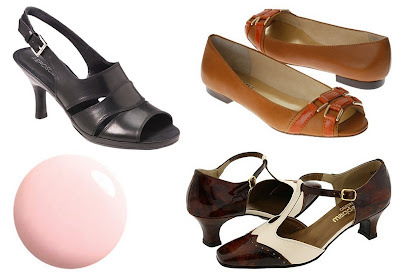 We got her a pair of black chunky-heeled open-toed slingbacks, a pair of tan and black delicate-heeled closed-toe slingbacks, and a pair of orange flats. Kind of like these. But way cheaper. When I first started working I had no one to help me at all. No one in my family would have had any idea what shoes I needed to wear at work, much less how to figure out what I wanted to do with my life, or what career I was temperamentally suited to. After all, High WASPs aren’t supposed to have jobs, per se. We might have a profession, but we wouldn’t call it a job. I’m not complaining. After all I had my inheritance. Reasonable tradeoff. Except of course that I turned out to need the money. So I made my own way. Another story. What strikes me as funny now is that at 26, in my first summer MBA job, I worried most about what to wear. And what to do about my hair. I still remember my greige silk skirted suit and dark blouse with self-tie. I struggled with a curling iron, trying to give myself the hair I thought a proper MBA-possessor ought to have, thinking that if I could only get the look right, everything else would follow. Quite silly, really. Since in that first job the regional sales office politics were so severe I was nothing but shark bait. Throw me in the water, make me bleed, see who surfaces, shoot the ones with large teeth. If I died in the process, who cared? I was chum (obscure word of the day), albeit chum with well-curled hair. But I survived that summer. And did eventually figure out the process for how to get the right look. Like this. Start by wearing the ultimate neutrals. Keep your head down, watch the natives, evolve into the shared culture of your work environment. Works every time and it’s worth it. For a woman at work the more anxiety you can eliminate about “Do I look OK?” the more energy you will have to fight the larger wars of petulant customers, dumb managers, and conniving subordinates. Oh, and I eventually figured out what to do when you are supposed to be shark bait. But that’s another story. So I took my daughter shoe-shopping. Then we got manicures and pedicures. What color? Pale pink. There is so much advice to be given that sometimes it’s best to start with the manageable. Open toes? Orange? How are these neutrals? The answer is that when you are young a little lightheartedness in shoes is actually better than showing up all-Ferragmo'ed out. As long as you keep the associated clothing very conservative you will look respectful but like you know your position. Except maybe in law. Or finance. Not my field, either of them. Yes. I agree. Start with the manageable. Can I just say that I really enjoy your blog..and am so curious about your life!!! I love Stuart Weitzmman and slingbacks. Pale pink nail polish is generally the best idea, unless it's sparkly. Then no. My job, by the way, is neither formal or creative. Nerdy with lots of men in polos. So my outfit yesterday was really above and beyond the dress code. "What color? Pale pink. There is so much advice to be given that sometimes it’s best to start with the manageable." I was very sad to find that the new (sample) Ferragamos at the Humane Society thrift shop were all size 10 AAAA. My friend Julie once sent me a pair of Ferragamos that had made it to the Atlanta Junior League thrift shop. They were just a little too tight for me, as I discovered halfway through the work day, and I had to hobble to the train at 5:00. Julie's advice? Just dangle them off my toe! I have very little patience for bargain shopping as well. Nice shoe choices. What could be better bonding than shoe shopping; lucky daughter. thank you for your comment! i hope your back is better now--tell me your back is better now! well, there is something to be said for the saying "it's all in your head". i will keep this in mind (no pun intended) ;) and seriously, you should wear that navy outift below. Congrats to your daughter on her first job! It is very uplifting to hear that recent graduates are finding jobs. I too was VERY consumed with how I looked when I first started to work. I felt that my clothing was my "walking portfolio". Ah..being fresh out of college.. I was so nervous upon starting my first "real" job! My mother and I went out to find office appropriate attire as well! Best of luck to your daughter!